After the success of World of Tanks it isn’t really a surprise to see more game publishers trying to steer into the same direction, offering their own rendition of the iconic franchise. I was one of the lucky few to be able to test out Ground War: Tanks before it opened to the public, and I took my time to find out what makes this game so special compared to the Tank simulation games that are out right now. Ground War: Tanks is a game that utilizes the Unity web player and thus everyone is able to play this game through their browser right away. This is definitely a major upgrade for a game like this, as myself and I’m sure countless others play games of this genre as a side diversion, and wish we could get into it from any location without waiting on a lengthy client download. Unfortunately I cannot get around comparing this game to its bigger competitor, and right from the start the similarities in visuals and UI are striking. Since you control every part about your tank, you yourself are responsible to the safety of your own crew. In the tutorial you are shown the ropes of driving your tank, and what you can expect to happen if you use the turret and try to shoot at other tanks. The usual set-up of gaining accuracy the longer you focus in on a target is present. Maneuvering your tank is easy and effective. This can be done with the WASD keys like you are familiar with in other MMO games. When trying to bring down other tanks, it is important to try and shoot them at their weaker parts, typically the back of the tank or turret. These weaker points allow you to do more damage on the tanks in general, and therefore have a greater chance of taking them down before they either notice you or try to shoot you down. 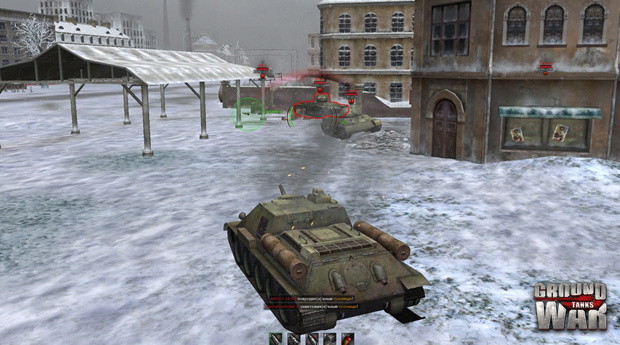 Unlike most unforgiving titles in this genre, most missions allow you to respawn after being destroyed, which changes the tactics of players in numerous ways across Ground War: Tanks game modes. 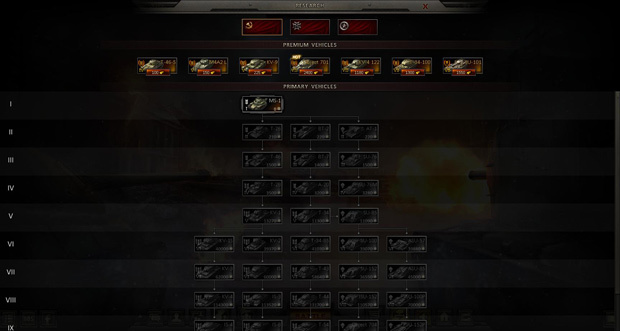 When you are still new to the game you are given a few tanks in the first tier of each faction’s tank tree. Currently there are three playable factions, the Soviet Union, Axis, and Allied. These three factions are obviously well known in the game industry. 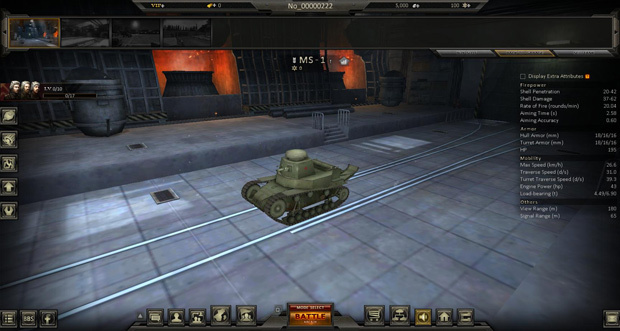 In each one of the available tanks you will have crew members; these crew members each have an individual skill. Obviously at the start your crew is still inexperienced, but the more you play, the higher quality of crew member becomes available to unlock. Your tank itself can also be upgraded with better parts, including upgrades to the Gun, Turret, Hull, Track, Engine and Radio. So if you want to stay in a specific tier range, but still want to gain an advantage over your opponents, you can do this by upgrading all of these parts. Better parts for your tank can also be unlocked by playing with said tank. Each tank gains individual experience and currency that can be used to unlock better parts on said tank. But these parts aren’t the only thing you can change about your tank. You can also choose the type of missiles you use. There are three available missiles for each tank. Although a few rare exceptions exist, typically they consist of improved armor penetration or explosive concussion. Ammunition is limited so you will need to replenish it after each battle so you won’t run out of missiles in the middle of the battlefield. Right now there are three available game modes for the player to try out. The first game mode is Commander Mode. 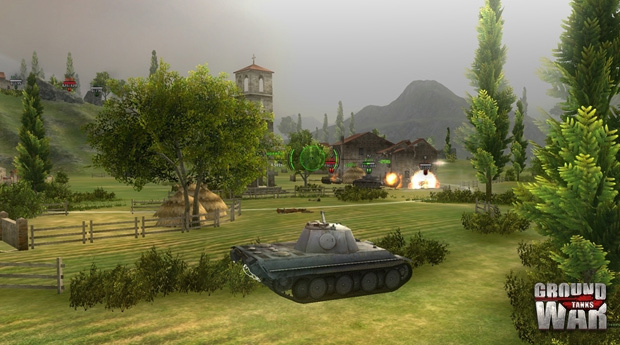 In this game mode you will have to kill the enemy’s commander to win the game. 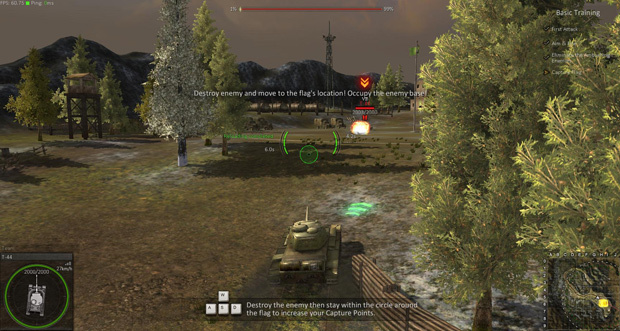 All players besides the commander can respawn, and this game mode can get really hectic as players act much more haphazardly than most online tank games as a result. Despite this, the kamikaze approach isn’t always ideal as the commander receives double the attack power, triple the armor rating, as well as bonus ammo shells. The matches last for 15 minutes and once a commander accrues enough SP, they can unleash special abilities that tend to bring the matches to an epic climax. The second game mode is the standard set-up. In this game mode you will have to capture specific areas or kill all the enemy players to win the game. Last but not least is the Arcade mode where players fight to obtain the most points. 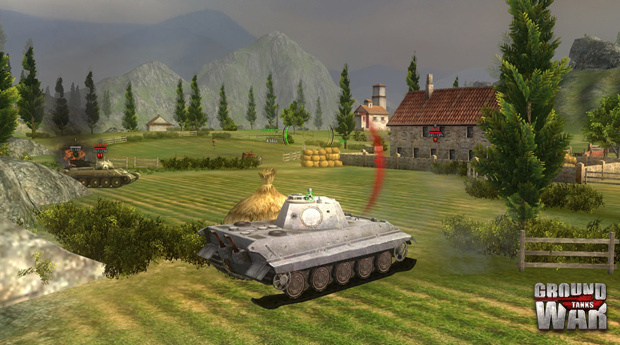 Each tank you destroy nets your team points and the first to the target point score wins. Then there is also Defense Mode; this game mode is not in the game yet but promises a base defense setting where you must fight off 12 waves of enemies. Out of all the modes this one sounds like the most promising and unique mode Ground War: Tanks will offer. If you have played World of Tanks and gotten this far into this article, you probably have the same thought as me right now. This game feels and sounds so similar, that it can be said it is almost a direct copy of the game. All the game mechanics, controls and the way you unlock new parts or tanks work exactly the same. Ground War: Tanks is trying to fight fire with fire in a genre that isn’t easy to break into. Ground War: Tanks unfortunately isn’t trying to be special as it lacks most any unique features besides being playable in the browser. This alone doesn’t feel like enough to attract a large playerbase. If you’re unfamiliar with the genre and want something you can pick up and play on the go though, it has solid enough gameplay to deliver. The addition of allowing you to respawn in most matches makes it a bit more forgiving as well, allowing new tank captains time to adapt and understand their enemies without having to explode and restart 100 times prior.